The empire strikes back to reinstate fluoride in Pinellas County, Florida where activists had it removed. With 700,000 residents in the county that is part of the Tampa-St.Petersburg-Clearwater metropolitan area, it had been arguably the biggest victory yet for awakened citizens lobbying to remove fluoride from the water supply. Last year, Tony Caso, a tea party activist and Infowars.com listener, petitioned Pinellas County, Florida to remove the fluoride. He was laughed away in his first attempts to raise the issue, but eventually, the tide turned and the County Commission voted 4-3 in favor of removal. He and other supporters had succeeded in convincing the council after presenting evidence of its many dangers, including lower IQ as demonstrated by the recent Harvard study. Chemistry professor Dr. Paul Connett has written extensively on the many other dangers posed by water fluoridation, including links to bone cancer, arthritis, lower thyroid function, and disruption of the pineal gland and its production of melatonin, a hormone that helps regulate the onset of puberty. Pinellas County didn’t add fluoride until 2004, and had been, until that point in time, the largest water district in the eastern portion of the United States to abstain from the practice. With the help of Tony Caso and others, Pinellas again voted to remove it as of October 5, 2011. But now, Pinellas County commissioners have changed their tune. November 6, when the country focused on the re-election of Barack Obama and the defeat Mitt Romney, many other important contests were going on around the country. For County Commissioners Neil Brickfield and Nancy Bostock, it was a bitter defeat. Both were Republican candidates in Pinellas, the first Republican incumbents to lose at the county commissioner level there in some 30 years. They blame their ousting on supporting the removal of fluoride. “I will never vote against fluoride again as long as I live,” said Brickfield, seeing his failed bid for re-election as a response to the fluoride question. Meanwhile, Nancy Bostock blamed ‘excessive’ and ‘unfairly emphasized’ coverage of the fluoride issue in the Tampa Bay Times throughout the election cycle. “When I was out in the community the topic of fluoride came up very, very little. But the coverage of it was excessive,” she told the Times. Though he was re-elected, commissioner Norm Roche, who also voted to remove fluoride back in 2011, says he’s seen the light, and had a change of heart about fluoride. 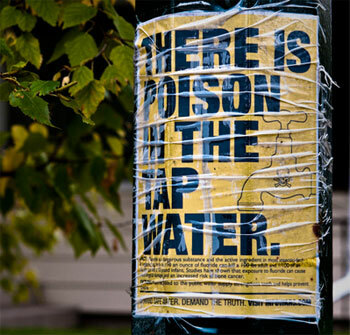 Now, Roche supports adding fluoride back into the water supply. Only the day before the election, Roche had sent an email referring to the campaign controversy over fluoride, which included Democratic candidates posturing on the issue as well as a number of outraged dentists decrying the removal, to be “an editorially-manufactured public hysteria.” But that’s all in the past. Democratic victors Janet Long and former state senator Charlie Justice both attributed their electoral success to fluoride, and have vowed to reinstate it as a priority during their terms. Commissioner Ken Welch voted against removing fluoride, and was re-elected with ease. Reading between the lines, we see that the pro-fluoridation interests have lobbied hard in Pinellas County to discourage the larger movement to stop the mass medication via the water supply otherwise institutionalized throughout the nation and much of the Western world. By targeting these county commissioners, the Empire struck back, and sent a message to petty officials everywhere not to stand in the way of an unspoken official establishment policy. While 2012 also saw big victories against water fluoridation, as in Wichita, Kansas, where a population of almost 400,000 voted against adding the toxin, the new battles in places like Pinellas County make clear that the establishment is not ready to give up. Even in relatively small locales like Watsonville, California (population 51,119), we’ve seen almost unlimited money thrown behind fluoridation. In 2010, what we were told is a very zealous dental lobby vowed to give the city the funds necessary not only to fight for fluoridation, and manufacture support for the policy, but to defeat and appease notable opponents. Watsonville’s most important business, Martinelli’s cider, had fought the fluoridation, calling it “morally and ethically bad for your body.” When the policy faced heated debate and possible defeat, money lined up to provide Martenelli’s with equipment to remove fluoride via reverse osmosis for use in production if it caved on its opposition. Nevertheless, opposition to fluoride has grown nationwide as individuals educate themselves on the complex of dangers associated with it in scientific studies. Where ever activists redouble their efforts, we will continue to see victories, even if hard fought. Tony Caso and other patriots in the Pinellas County area are already a huge testament to the effect that people can have when they get active, even as the system has lashed back to undo their significant efforts.